Cinco’s eco-friendly couture creations, plus behind-the-scenes snapshots. Left: Michael Cinco with ANTM judges Andre Leon Talley, Tyra Banks and Nigel Barker. Right: An ANTM contestant wears Cinco’s couture piece. Click for more photos by Nigel Barker. (SPOT.ph) Filipino designer Michael Cinco, who is now based in Dubai, has revealed to La Moda Dubai how he got to participate in an episode of America’s Next Top Model, which will be aired in the US on April 13. According to Cinco, Filipino ANTM producer Michael Carandang asked him to submit his sketches to Tyra Banks, the show’s supermodel host and creator. Banks then asked him to make couture pieces using eco-friendly materials for a photo shoot featuring the six remaining contestants. 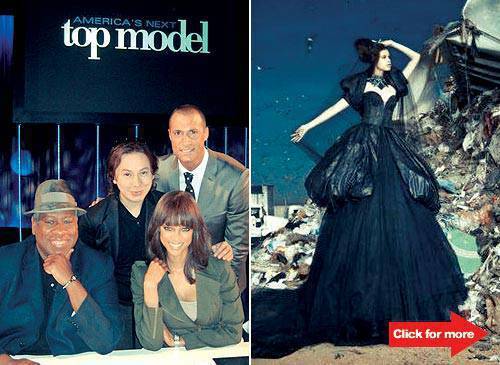 The shoot with ANTM judge and photographer Nigel Barker took place in November last year in a Los Angeles landfill. "I designed couture dresses using safety pins, rubber bands, broken mirrors, cellophane, garbage bags and old parachutes... Luckily, Tyra liked all (the designs)," Cinco told La Moda Dubai. "Tyra wanted me to create huge and voluminous dresses to overpower the massive landfill." He added, "I’d say that we achieved the look. In some of the shots, there was one dress that looked like melting metal and there was another one that looked like cellophane splashed with oil." Cinco said Banks and another ANTM judge, US Vogue’s Andre Leon Talley, raved about the pieces he made for the shoot. "He even exclaimed upon seeing one of the dresses and (said) even if it was made from recycled materials, it would still be red-carpet glamour for any famous Hollywood celebrity." Of Banks, Cinco told La Moda Dubai, "Tyra Banks is super down to earth. She’s a doll. I remember the first things she told me were ’So you’re the first Filipino designer on the show’ and ’Did you bring all the bling from Dubai?’ She was hilarious and she loved the collection I made; no doubt she will always be one of my personal favorite supermodels." For more on this story, log on to La Moda Dubai .